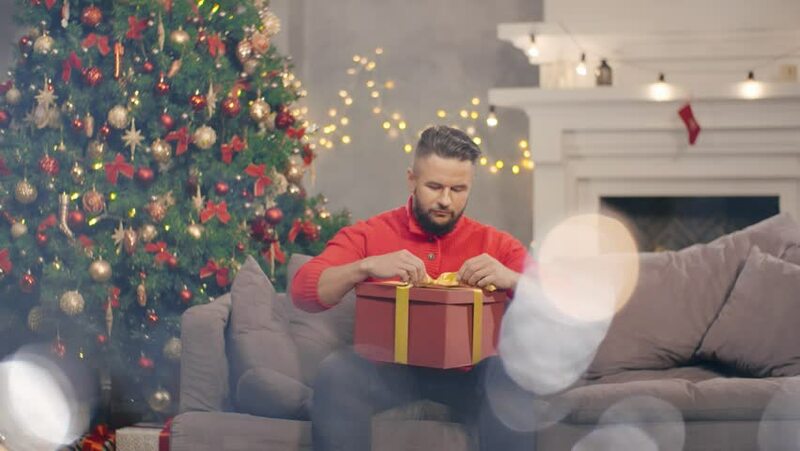 Young bearded man opening his christmas present sitting in his decorated living room. hd00:14The little girl sits in a wooden chair near a fireplace. The lovely nice girl the fairy tale New Year's Christmas character considers the sealed gift in a red box. Little snow queen. 4k00:31Santa Claus using green ribbon to package christmas present to deliver it to children. 4k00:18Happy family decorating christmas tree together, man holding his little daughter to help her to hang a decoration. 4k00:15Little caucasian girl giving her parents christmas ball and helping them to decorate christmas tree. 4k00:17Young married couple and their little daughter decorating christmas tree together in their house. 4k00:13Santa listening to little girls wish and letting her go. Background, christmas tree, New Year. 4k00:29Husband giving a christmas present to his wife sitting together on couch in their living room. 4k00:19Young man opening his christmas present and getting disappointed. Discontented guy on New year eve.